SKF has announced the introduction of its Lincoln SLC metering device for grease. Developed for use in single-line lubrication systems, this compact metering system boasts a modular design for less jointing and decreased risk of leaking. Featuring a spring-reset control piston, the device has a high venting capability for compatibility with greases up to NLGI 2 and provides reliable operation in harsh conditions and low temperatures. 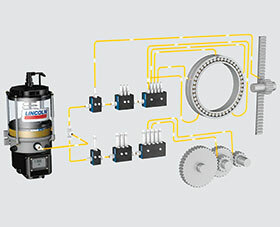 Delivery volume can be either adjusted via regulating screws or set via dosing adjustment; both options ensure each lubrication point receives the required amount of lubricant. The SLC is available in two versions – the SLC1 for one to twelve outlets and the SLC2 for one to six outlets. Both are offered with BSP or NPT threads and in C3 corrosion classification. Metric and imperial sizes are included for inlet and outlet fittings. The system is suitable for use in renewable energy, construction and mining applications, as well as when replacing smaller, mid-pressure, dual-line lubrication systems.